How to up-lift a conversation super-fast: focus on strengths. And everyone has them! The one indispensable resource for over 20 years! To purchase this product (operating through Campion My Connect) click on the Campion Bookshop button (at the top of this page under the price). This will take you to the Campion bookshop. After purchase, download the Campion App and Strength Cards will appear in your library. Here is some more information to guide you. Strength cards can also be purchased as a boxed card set with booklet. To purchase click here. Published by Innovative Resources, 2017. ‘I used the new edition Strength Cards this week in an introductory workshop I was asked to do at Leeds Metropolitan University’s festival for staff development. My session was on the subject of Emotionally Intelligent Leadership. I used the cards to help stimulate participants to identify five talents and to share these in small groups. This helped open up a discussion about why it is so hard to talk about what we do well and the implications of this for our management style. I used the beautiful Picture This cards later on in the session when I asked the participants to identify images of self-control. The cards were great at moving them beyond the normal brainstorming of words into a more creative space—and the cards looked great as a display! I had to stop people taking them home with them. Several participants commented about how wonderful the cards are. So a big thank you for producing such beautiful resources. I will be recommending and using them at the Advanced Facilitators programme I am running later in the year. I hope this will stimulate some more interest in the UK! As we went round the circle, they named each other’s strengths and then gave stickers with kindness and love. Behind those doors was a group of people who functioned as a team and respected each other. The stickers didn’t show them their strengths—they already knew how much they appreciated each other—but the stickers showed me. That was six years ago. The stickers are still on their computers. It taught me that a conversation about strengths is for absolutely everyone, and the stickers are great memories of awesome conversations that people hold onto …for years and years! St Luke’s worker Lisa Henderson knows all about the importance of gifting. Twelve years ago, she was a young Child Protection Worker employed by the Department of Human Services. She was in regular contact with colleagues at St Luke’s Anglicare, and one day a report arrived on her desk with a surprise attached. Lisa had been gifted one of Innovative Resources’ original Strengths Cards. The card read: ‘Courageous’. Ask anyone who’s been there and you’ll hear that working for Child Protection isn’t easy. It’s rewarding, but tough work. Lisa clearly remembers the moment she received the card: the sense of recognition, the sense of collegial support and encouragement. A little while later, she received another card: ‘Organised’ (‘Not that you’d think I was organised if you looked at my office!’ she laughs). The simple pleasure of receiving a card alerted Lisa to how powerful such a small gesture can be. ‘These cards followed me around at Child Protection through fifteen desk changes and seven different positions,’ she recalls. Today, she still displays the cards by her desk at St Lukes’ office in Bendigo. ‘I love the Strength Cards and often use them in incredibly simple ways. In psychotherapy sessions I ask a client to pull out from the pack any strengths they recognise in themselves—there’s always far more than they imagine. We then spread them out over the floor and I ask them ‘How often do you think of yourself in this way?’ The answer is often ‘never’, with a certain amount of amazement. It is always an extremely powerful exercise. Afterwards, I give them an A4 poster and a credit card sized laminated copy of the list of strengths they have identified so they can carry always them and celebrate these strengths. We have a Peer Support program where Year 10 students are invited to play a part in helping Year 7 students to transition more smoothly into a secondary school environment. About a third to a quarter of Year 10s volunteer and they receive some training and support from teachers such as myself who are Peer Support facilitators. It can be a tremendous learning experience for both the older and younger groups of students. I recently met with 30 of the Year 10s, in five groups of six. I spread all the Strength Cards on the floor. Each person was asked to select a strength card and a corresponding sticker that represented a strength they thought they had. Some people wanted the same card and valuable negotiation happened around this! Now, each group had six different strengths and its own sheet of paper with the stickers on it. We then discussed how to plan the next session around the strengths of each team. My intention was to revisit these sheets after their next session with the Year 7s and ask each group how they felt these strengths were used. At our next meeting the Year 10 students reported that their session with the Year 7s had been a bit difficult. They felt that they didn’t really have their attention. With some gentle probing I realised that the student Peer Educators had not really taken the time to define their roles or discuss how to utilise their strengths as a team. We then revisited the strengths they had identified earlier and discussed practical ways that they could draw on these. One of my learnings from this was that it can be ‘warm and fuzzy’ to simply identify strengths. However, it is very important to work with students on how to implement those strengths. I frequently use the Strength Cards as a means of engaging with the child at a first session. The simple exercise of asking the child to select four or five cards out of the pack that say something special about them (and the ensuing discussion) can elicit a lot of information about what is important to them; their interests, skills, hobbies and so on. This information can be used later to develop interventions (comfort strategies, for example) when the sad feelings overwhelm them. As part of a program, I run groups in creative play for parents and pre-school children. The purpose of these groups is for parents to learn about how children play and its importance in their development and learning. The groups are an opportunity for parents to understand that there are different types of communication and about how adults can facilitate learning through play. I remember a particular group where the children ranged from about 18 months to five years old. At one point I spread the Strength Cards out and invited parents to select cards they felt represented the strengths they had in connection to their child’s play activities. A parent might select, for example, the ‘Patience’ card or the ‘Enthusiastic’ card. There was one particular mother who came to the group with her two-year-old daughter. This mother did not want to select any card because she could not identify any strength in herself in relation to play. I gently challenged her about this and it gave rise to a discussion about what she did not like about play. She spoke about her dislike of the messiness of some play activities—the sloppy mud pies and the gooey slime. During the first half of the group the children were with a child care worker while I worked with the parents. The parents made play activities for the children. This particular mother was very comfortable fetching ingredients for the playdough but held back from the hands-on kneading. The children were then invited to come and enjoy the play activities that the parents had set up for them. The mother was frustrated by the fact that her daughter seemed to be circling the activities rather than diving in. It was at this point that the penny dropped for the mother as she made the connection that she and her daughter both felt the same way about messy play—that she modelled the dislike for her daughter. This was a big revelation for her. While this new understanding did not come directly as she used the cards, I do feel that the earlier discussion and reflection with the cards played a major role in opening up the deeper perception. I wanted to keep the cards handy as I’m an emergency teacher. But I especially wanted to have them for home. With seven people in our household we can easily become focussed on what we find annoying about each other. So it’s good to do something every now and then to remind us of the positives in those around us— and ourselves. The day my Strength Cards arrived, I put up A4 sheets of papers, one with each family member’s name, on a sliding door in our kitchen passageway. It’s a high traffic area in our house. Then I blu-tacked a large selection of Strength Cards onto the door, so people could place the strengths next to individual names to recognise the strengths of family members. It was very popular and successful too. I was able to speak to the kids individually about strengths and about family member’s strengths without needing to gather the whole family for a meeting. People could move the cards around while they were walking past— it didn’t take any effort or time. We had some simple rules to support our focus on personal strengths. For example, it was OK to let people know which strengths you put next to their names, but you didn’t have to. It was also OK to move a card from one person’s name to another, but only after the first person had seen the card and knew that someone had recognised that strength in them. It was even OK to put strengths next to your own name. The one action that wasn’t permitted was to take away a strength from someone’s name because you disagreed that they had demonstrated it. After all, someone else had thought that strength should be there! It was a great activity which I plan to do again. I currently have just one strength on the door, where family members can reflect on it as they pass. I can use it to draw people’s attention to times when that strength is used or required. ‘Resilient’ is the current one. Neville Bleakley is the Coordinator of the ACT Academy of Sport Orienteering team. In 1999 his squad of 10 young people aged between 16 and 25 years competed in the World Championships. Neville has been using visualisation, positive self-talk, affirmations and relaxation with the team for some time. Members have an individual pre-competition routine which they run through for physical and mental preparation. Affirmations form an important part of this and include statements like ‘I am’ or ‘I feel’. These statements can’t just be pulled out of the ether but have to be true of the individual. As Neville says, the unconscious is not easily fooled. He has found the Strength Cards and Strength Cards for Kids invaluable to this process. Prior to using the cards, the athletes had some difficulty articulating their strengths. However, Neville says they enjoy the graphics and humour in the cards and use them as prompts to enable them to more easily identify the strengths which belong to them. Strength Cards in a fish ‘n’ chip shop! My daughter went to Adelaide recently to catch up with an old friend. While over there, they drove down south to visit a winery in McClarenvale and stopped in Port Elliot to buy fish’n’chips. On the wall in the kitchen, clearly visible from the shop, was a collection of Innovative Resources’ cards from various packs. It was too busy for her to ask about the relevance of the cards, but it just goes to show that there is no end to the possible applications for seriously optimistic materials! Would you like salt and vinegar with those Strength Cards? I was talking with a young woman who had been in a violent relationship and was thinking about returning to the relationship. I took out the Strength Cards and I said to her, ‘Think back to 12 months ago when you were living in that relationship and tell me what strengths you were using then to help you cope.’ She selected some of the cards. Then I asked her to pick the strengths she uses in her life now. We looked at the two selections. It was so revealing for us both to see that the strengths she picked for 12 months ago were all about supporting and caring for someone else, and enduring difficulty. Whereas the ones she picked now were all about positive self-esteem, developing and respecting herself. I have recently been using the Strength Cards with my engaged couples at Centacare, Rockhampton. I’ve found the cards to be a valuable resource when working with couples on their family of origin. I ask the couples to choose five cards which best represent strengths from their own families as they were growing up. I then ask the couples to choose five strengths they would like to see as representative of the family they will soon be creating. I’ve found the engaged couples enjoy the simplicity and novelty of these cards and it’s a great way to help them discuss the various values/qualities they hope to build. Limiting the number of cards they choose also tends to make discussion vital and often lively as they clarify their thoughts, feelings and values. I’m a freelance social work consultant and, when working as Coordinator of Training and Assessments at Wanslea Family Services (WA), I assisted with the development of the Foster Assessment package, used statewide. I was also seconded by the Family and Children’s Services Department in 1996 to develop ten training manuals for use with foster families across the state. When I first saw the Strength Cards, I realised how versatile and useful they could be in assessment work, and I’ve been using the cards now for at least six years in foster and adoption assessments. I use them when assessing self-esteem in marital partners, and in gauging the degree of reciprocity in appreciating and in valuing each other’s strengths. I also use the cards for partners to talk about their own and the other’s ‘areas that need to be strengthened’, which then can be cross referenced against previous answers on conflict resolution to test for consistency. Inevitably, the children in the family spy the cards and enjoy talking about their own strengths, which has encouraged me to leave the cards with some families, in between interviews, for their own use. Strength Cards to the rescue! 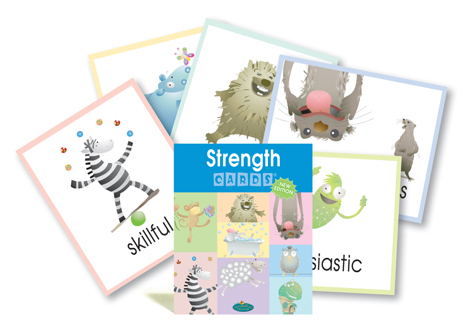 I have enjoyed using the Strength Cards with both adults and children. One story you may be interested in happened in the middle of last year. At West Epping Uniting Church we run a monthly program for the mothers of children under five, called ‘Kid Free Time’. We have morning tea then a speaker, while the children are looked after by the older members of the congregation. We get up to 25 mothers and 40 children. Last July we had organised for a particular speaker to come, but at 8.30am she rang to say she was ill and would not be able to come. Panic! However, I grabbed my packets of Strength Cards and thought it must be possible to do something with them. I invited them to talk about what strengths they thought they had and what had changed since they’d had a child. These were people who did not necessarily know each other before this, so it could have been rather confronting. Then they walked as a group around the room, just to see the cards in other people’s groups and then could talk a bit more about any that struck them. Then I swapped the cards for Strength Cards for Kids and asked them what their aspirations were for their children and how they would go about achieving that. They were hooked. Needless to say, the time went very quickly and no one wanted to stop talking. People were also appreciative that they had had the chance to really talk to each other instead of just listening to a speaker and being involved in a question time. So, thanks for a great resource that well and truly saved my day! I am a child-care worker and at our final staff meeting each year we have to reflect on how our year has gone. We also take the time to thank our co-workers for what they have done for us over the year. This often gets very emotional. I generally find it hard to use the right words and most of the time I get stuck. But this year I had my set of Strength Cards, so was able to go through them and find the right card that matched the person and how I felt towards them. I had many heartfelt responses to the way I approached this and the cards were a huge hit. Thank you for making such wonderful resources for child-care workers to have and use. Ali Gwyer is a storyteller and meditation teacher who regularly works with individuals and in group situations. 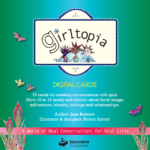 Here she describes the fun that’s been had and insight gained from using Innovative Resources’ cards and books in her work with childcare professionals and her home-based meditation practice. ‘Having trained in primary and kinder teaching, and lectured in child care, I’ve been especially interested in self-esteem, creativity, meditation and relaxation for young children, parents and staff in centres. I also run classes from home, incorporating storytelling and spirituality, along with meditation. Strength Cards have been a success in both formal workshops and the meditation work I do from home. At the beginning of a workshop I ask each participant to choose a card, then discuss why they are at the workshop and what they see as the strength they’ve brought with them. The discussion takes place in pairs with each partner reporting back to the main group. At the end of the session each participant keeps their strength sticker.